Okay, I'm responding to Deborah Ager's challenge to make my own list. 1. Black velvet is elegant and lovely, but not mandatory. Oftentimes, the best poets don't look like poets (you know, the berets, the beards, the capes). 2. There's no money in it. None. That's why poets are more generous than other artists. Usually. 3. You must love words, must collect them the way some people collect coins or shells. And you must always be on the lookout for new ones. 4. Any day when a new poem is underway is intensely exciting. The poem goes everywhere you go. There's something obsessive about this. 5. Real poets read poetry. Voraciously. It's how we go to school each day. 6. You would write poetry even if no one published you. But you might not revise so carefully. 7. Poets must sit on their poems the way hens sit on eggs. There's no way to rush this. Each time I go to the post office to mail out submissions, I come home with an enhanced appreciation for those journals which accept submissions via email. With the cost of postage, mailing envelope, SASE, paper, and printer ink, sending out can get costly. Fortunately, a number of good journals now accept via email, some only that way. Here's a short list of journals that accept by email. All of these accept simultaneous submissions unless indicated otherwise. There's a much lengthier list maintained online by Louie Crew. There are a few drawbacks to this list: 1) it does not indicate which are print and which are online journals 2) there is a huge variation in quality of the journals. So do be sure to check guidelines and past issues carefully. Let me know if you have any print journals to add to my list. 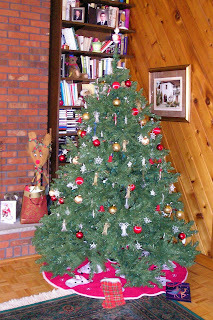 Here's this year's Christmas tree. If you look real close, you might be able to see the beaded ornaments—angels, candy canes, snowflakes. I made them with my own two hands years ago when I was in my domestic phase. Tiny beads have to be strung on thin wires. Then comes the twisting and shaping. It was pain-staking work and wreaked havoc on fingernails, but now they're part of our Christmas tradition. I just finished reading a wonderful essay in the January / February issue of Poets & Writers. It's titled "To Make Me Who I Am: Poetry As a Way Out" and is by Reginald Shepherd. I feel like I've made a new friend, though I've never met Reginald. The content of his essay is fascinating and took me into a world very different from my own. Although the poet writes about the hardships he endured, he does so without self-pity, though he's entitled to a good dose of that. Instead, there's encouragement for those who have to struggle in this life. Raised in the ghetto only by his mother, he was sent to private schools where he received the advantage of a good education but where he never felt like he belonged. When he was just shy of 15, his mother died and he was sent off to be raised by relatives who made him feel like an outsider. Throughout his difficult growing up—and he never pretends it was anything other than difficult—what saved Shepherd was poetry. He writes about discovering T. S. Eliot: "Eliot wrote that poetry is not the expression of personality and emotion but the escape from them. He also wrote that only those who have personality and emotions know what it means to wish to escape from these things, a marvelously bitchy comment that also contains a profound truth about the burden of identity, the suffocating weight of selfhood." He writes about imitating Eliot while struggling to become a poet himself, to move beyond his "personal needs and desires, beyond the poem as personal expression and toward the poem as an independent object in the world." Poetry, Shepherd writes, was what kept him sane. That and books and the library. After high school he went off to Bennington College. He speaks of two teachers who had a profound influence on him. For example, from Ben Belitt he learned that "art is the lie that tells the truth, and that the truth art tells need not be about oneself." That's an education right there. Yet Shepherd dropped out of college at the end of his junior year, worked for a time, then returned and completed his degree, then went on to earn two MFAs. He writes of the never-ending search to find the place that is right for him, a place that seems elusive but which he is optimistic enough to believe exists. This essay is full of wisdom, full of the rough fabric of real life, and it's beautifully written. 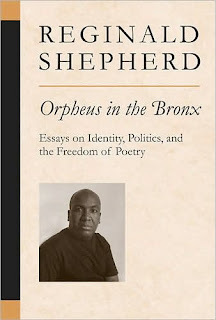 I was delighted when I reached the end of it to learn that it's one essay in a collection of essays by Shepherd: Orpheus in the Bronx: Essays on Identity, Politics, and the Freedom of Poetry. So I immediately pre-ordered it. While I was at it, I also ordered Fata Morgana, Shepherd's most recent poetry collection. And while I was treating myself, I also ordered Paul Guest's Notes for My Body Double and Greg Rappleye's Figured Dark. My bookshelf runneth over. I've also added Reginald Shepherd to my blogroll. Pay him a visit. His blog is like graduate school without the burden of tuition. But I was sorry to read that he is beginning a round of chemotherapy. So let's all send good thoughts his way. Some humanotherapy. I confess to having mixed emotions about performance poetry. 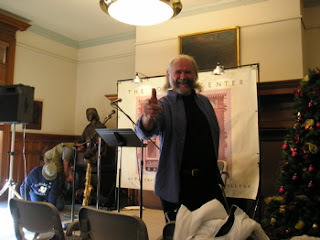 I have on several occasions attended a performance poetry reading and been captivated by the singing and the physical presence of the poet or poets. But then when I took the poetry home and sat down to read it, I've been disappointed to discover that the poetry on the page didn't measure up to the poetry on the stage. So it seems to me that the music and performance can sometimes cover up a lack of craft. I've also sat through performance readings where it seemed that the poetry consisted largely of screaming, pacing the stage, and hurling obscenities. And then when I later sat down with Patricia's book, with her words on the page, I was just as riveted as I'd been when she'd stood before me. So I never know what to expect when I attend a performance poetry reading. 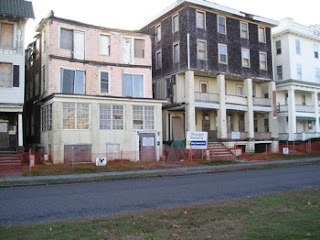 I went to one on Saturday, December 1, again in Paterson. 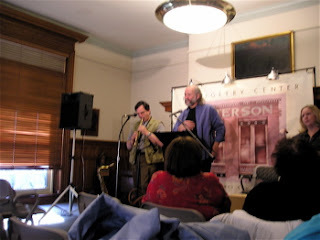 The poets were Charlie Rossiter and Al DeGenova, a duo, and Kurt Lamkin. I've known Kurt for several years. I first met him when I brought him in as a guest poet at the high school festival I ran for seven years when I was teaching. Then I had him back again. Later, I ran into him yet again when he first was featured at a Dodge festival. I'd never met Charlie or Al but knew their names. Charlie and Al went first. Their reading was full of music and instruments, singing, and wonderful poetry. Two gentle souls. Then Kurt performed and as always was wonderful. 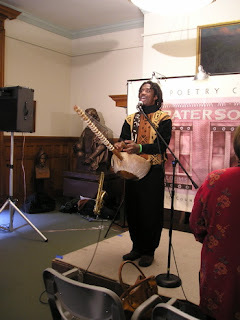 He played a kora, a 21-string West African instrument which, by tradition, must be made by the performer. I went home with Back Beat, Charlie and Al's co-authored collection; AvantRetro, their CD; and two CDs by Kurt, Magic Yams and String Massage. I look forward to the reading and the listening. I'm delighted to be the Featured Poet at Poetry Southeast. The feature includes three sample poems from each of my two books. What Feeds Us is represented by "Pyromania," "Invective Against the Bumblebee," and "Linguini." Eve's Red Dress is represented by "The Missing Wife," "Last Dance," and "My Husband Discovers Poetry." So click the link and check it out! A review of What Feeds Us will appear in the fall issue which should be available in a few weeks. I also have poems in two recently released anthologies. "Pastiche for a Daughter's Absence" appears in Family Pictures: Poems & Photographs Celebrating Our Loved Ones. Edited by Kwame Alexander, the collection is exactly what its title says it is. Poets include Barbara Crooker, Tony Medina, Karla Huston, Shin Yu Pai, Nikki Giovanni, Susan Rich, and Lucille Clifton. Two of my poems, "First Cold" and "Her Daughter's Feet," appear in White Ink: Poems on Mothers and Motherhood, edited by Rishma Dunlop. Here I'm in the good company of such poets as Adrienne Rich, Jean Valentine, Martha Silano, Ann Fisher-Wirth, Molly Peacock, Joy Harjo, and Alicia Ostriker. 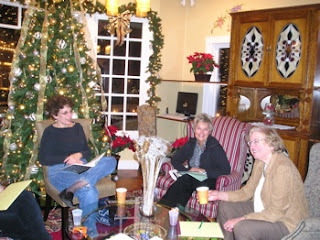 I have a few more things to add about the poetry retreat. In my last post I told you about the retreat itself. 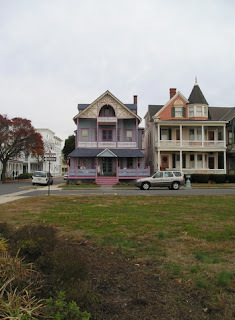 Now I'd like to tell you a bit more about Ocean Grove as the town added to the pleasure of the retreat. 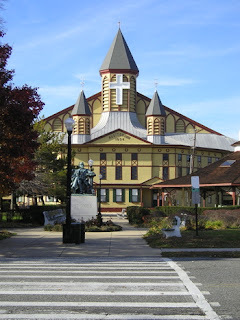 Ocean Grove has a long history and is best known for its religious revivals that still take place each summer. Hundreds of Methodists gather to vacation and receive spiritual renewal. The central gathering place is the Great Auditorium. This large building is at the end of a square. Directly ahead of this building is the grassy square where birds gather and people walk and bike. Our inn is to one side of the square. 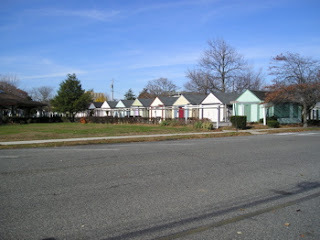 Across from us is another row of houses and inns. 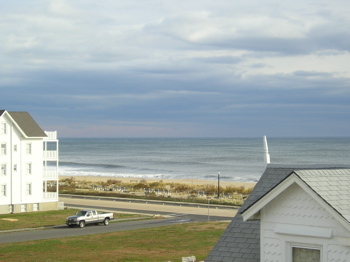 At the opposite end of the square is the boardwalk and just beyond that the beach and ocean. To the immediate left of the Auditorium is Tent City. In summer the small structures in the front row are covered with tent fabric and people live in them for the time of their stay. The tents have no plumbing and neither do the cottages behind them. Residents use the public facilities found on the other side of the Auditorium. As the Methodists are present only in summer, these buildings were empty during our stay. 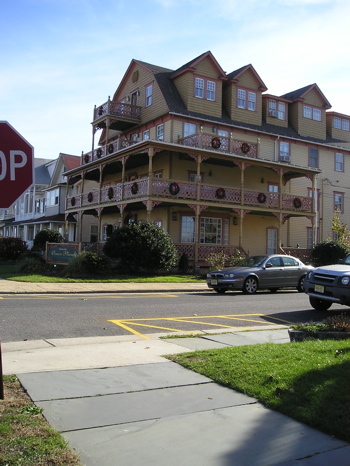 One element of the old: Ocean Grove remains a dry town. No liquor licenses in any of the restaurants, though patrons can bring wine (a concession to modernity) and no liquor stores. Not too long ago residents and vacationers alike had to remove their cars by midnight Saturday night and could not bring them back into town until midnight on Sunday. People moved on foot only. It's the one to the left. I chose anything else and wrote my poem about being a rock star. While conferences and workshops were very important to me for a number of years, I eventually began to feel that I'd outgrown the model but still wanted some kind of group activity. For the past three years I have run a Women's Poetry Retreat. The first year it was held in Spring Lake, NJ, and the last two years it has been held in Ocean Grove, NJ. 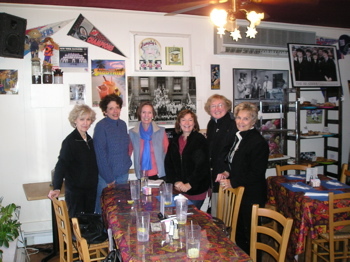 The retreat takes place the week after Thanksgiving. It includes women poets only, all of whom have been writing and publishing for a number of years. I invite the poets and line up an inn. Each poet then makes her own room reservation, and I pretty much fade into the background. Although I organize the event, I do not lead workshops during the retreat. Instead, I ask each participant to bring two poetry prompts. Then over our three and a half days, we take turns giving each other prompts. I step in with my little whip only if we get off focus, but we are all there on the same mission: to write a whole bunch of new poems. This year's retreat was held in The Ocean Plaza Inn, a lovely Victorian inn, newly renovated. The finishing touches for the holiday decorations were being added as we arrived on Monday afternoon. Our first evening we ordered pizza and antipasta, which we enjoyed in the dining area of the inn. Incidentally, the only costs incurred are for a room reservation and food, so this retreat is significantly less expensive than an official conference. After the pizza we gathered in the living room. 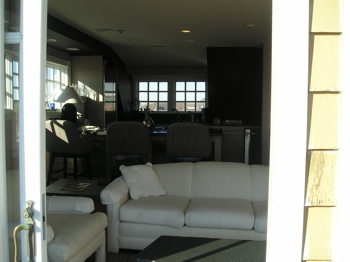 (One nice perk that comes with this inn is that we have access to its living room as well as to the living room in the inn next door.) I took the group through the first prompt. We typically allow 20 minutes for each prompt, then read the drafts with only minimal commentary. Here we are the first night. 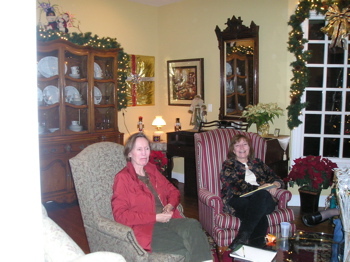 Pictured above: Susan Jackson whose first collection, Through a Gate of Trees, was recently published by CavanKerry Press, and Barbara Crooker whose first collection, Radiance, won the Word Press First Book Prize and whose second collection, Line Dance, is right now rolling off the presses. Pictured here are Jessica deKoninck whose chapbook, Repairs, was recently published by Finishing Line Press; Wanda Praisner, author of A Fine and Bitter Snow (Palanquin Press, 2003) and On the Bittersweet Avenues of Pomona, which won Spire Press' 2005 poetry chapbook contest; and Betty Lies, author of the textbook, The Poet's Pen: Writing Poetry with Middle and High School Students, as well as two poetry manuscripts in circulation. We met again on Tuesday morning, after the continental breakfast which is included in the room fee. Each year I ask the women to bring a poem on a specified topic. This year we each read a poem we admired for its music. Then we wrote to two more prompts. 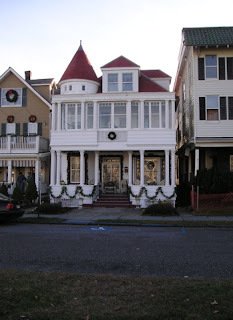 One of the lovely benefits of Ocean Grove is the main street right around the corner. Lots of little shops and everything beautifully decorated for the season. That first day we had lunch in The Daily Grind, a cozy little spot that makes its own bread and baked goods. Then we returned to the inn for our afternoon session, two more prompts. So by three o'clock Tuesday, we had each already written five new poems. Of course, not all of the poems will survive, but the level of writing was quite astonishing. There's something about this kind of gathering that creates a very fertile field. After a few hours of private time for reading, napping, or walking along the beach, we all went to Bistro Ole, an extraordinary Portuguese restaurant. The food is wonderful and the hospitality is warm. We then finished up with a read-around back at the inn. Each of us read a favorite poem by someone else and then a poem of our own. Wednesday was a repeat of Tuesday, minus the specified morning poem. For lunch we had leftovers from the night before—except for me who walked around the corner and bought some yummy soup and hit the Ocean Grove Bakery for an apricot danish and chocolate chip mint cookies and what the poets said were the world's best ginger cookies. 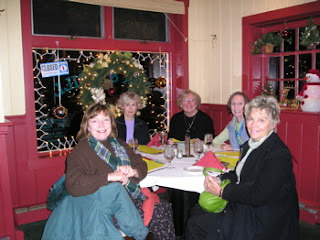 That night we took our amiable innkeeper's suggestion to dine at the Draughting Table in Asbury Park. It's a charming Irish pub, very reasonable prices, and excellent food. Then we had one final read-around back at the inn. Thursday morning was our last writing session. All of our morning sessions took place in the space you see below. 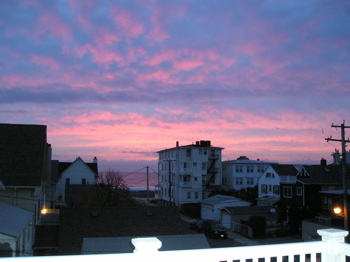 I took this shot standing on the balcony, beyond which is a view of the ocean. We sat on the sofa and surrounding chairs. 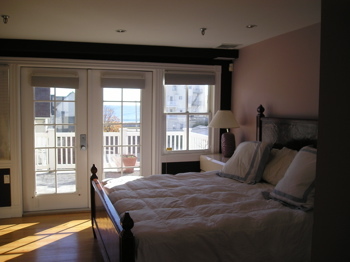 This is the upstairs of the suite the innkeeper gave me because I organized the retreat. It's two floors with a spiral staircase in between. You can see the kitchen area in the background. Then there's a full bathroom around the corner and a bedroom. 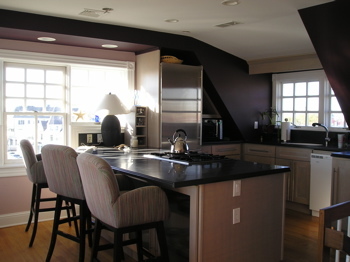 Here's a closer view of the kitchen. And here's a view of the ocean from the living room. We were only half a block from the ocean. We finished up around noon, then headed for home, tired but enriched by the poetry and the friendship, our bags loaded with drafts of 11 new poems each. Here's the view at 6:00 AM on the last day. You can understand why it was hard to leave.